Croatia is a country in Southeastern Europe. Its capital city is Zagreb. The Republic of Croatia is a small country between the Mediterranean Sea and Central Europe. It was one of the republics of the Socialist Federal Republic of Yugoslavia. It became independent in 1991. It joined the European Union on 1 July 2013. A very long time ago, in this territory lived Illyrian people and they were ruled by Rome. In the seventh century AD, northern Slavic people came to live in the Balkan peninsula. Austria-Hungary makes the Croatia free from Ottoman empire and was ruled in today's Croatia until 1918. In 1918 it became a part of Yugoslavia which was taken over in World War II. After a small war with Italy a fascist dictatorship formed the Independent State of Croatia in 1941. It was not independent for long. Like all other countries in Central Europe the Nazi Germany had strong influence (see also Jasenovac concentration camp). In 1945, Croatia became a part of new, communist Yugoslavia (Socialist Federal Republic of Yugoslavia) which collapsed in 1991. Croatia is now independent for the second time. Dalmatia is part of Croatia. Today Croatia is popular for tourists. 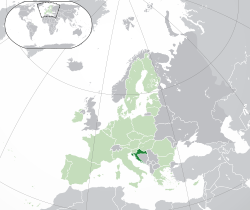 The country's reliable economy makes it possible for Croatia to join the European Union on 1 July 2013. Croatia is one of the richest countries of the Balkan Peninsula and of the former Yugoslavia's countries. But Croatia had also the highest cost prices of the whole Central Europe. The average monthly salary/wages in Croatia standing on 739 euro or nearly $1000 USD. The retirement age for men is 65 years and for women 60 years. The health care enjoys relative strong protection for the country's inhabitants. The education is free and required until the child reaches the age of 15. Many choose to continue their studies in high school until the age of 18. ↑ (in Croatian and English) (PDF) Census of Population, Households and Dwellings 2011, First Results by Settlements. Zagreb: Croatian Bureau of Statistics. June 2011. p. 13. ISSN 1332-0297 . http://www.dzs.hr/Hrv_Eng/publication/2011/SI-1441.pdf. Retrieved 30 June 2011. ↑ "Human Development Report 2011". United Nations. 2011. http://hdr.undp.org/en/media/HDR_2011_EN_Table1.pdf. Retrieved 27 November 2011. This page was last changed on 20 December 2014, at 16:47.